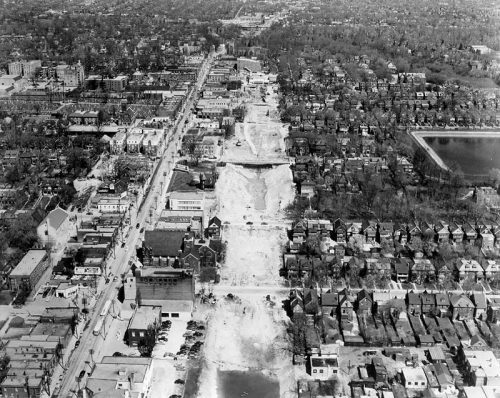 Photographer: Northway Survey Corporation Ltd.
A second boom in apartment building construction got underway in the postwar period. The arrival of new construction technologies combined with rising land prices encouraged developers to engage in high-density site planning by constructing highrise apartment buildings, allowing for a large return on a small property. This kind of residential form proved to be as economically viable in single building projects as in multistructure developments built over several city blocks, such as St. Jamestown. 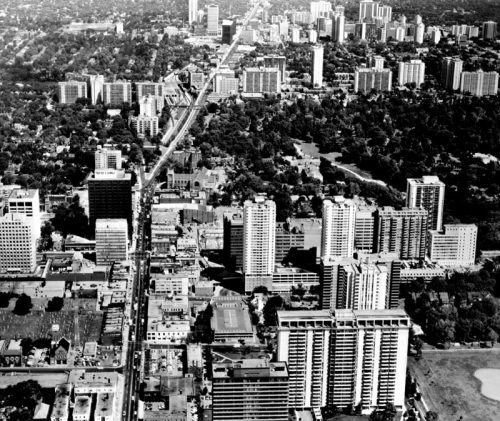 Equally suited to any area of the metropolitan city, whether downtown Toronto, or in the suburban reaches of Etobicoke, Scarborough and North York, it was restricted only by the local zoning laws in effect in any given area. The arrival of Toronto’s subway system in 1954 had a special impact on this type of development, triggering the construction of several pockets of highrise development along its route.